UPDATE: Indiana Microbrewers Festival was voted Best Local Beer Fest 2015 by NUVO readers. We had a blast with thousands of our friends and 100 breweries from Indiana and beyond at the 20th Annual Indiana Microbrewers Festival, one of three annual fundraisers (along with Winterfest and Bloomington Craft Beer Festival) for Brewers of Indiana Guild, the non-profit that represents Indiana’s craft brewing industry. On July 18, we sipped hundreds of beers from 68 Indiana breweries and dozens of guests, munched on food from local restaurants and food trucks, and listened to Central Indiana musicians. We also raised more than $10,000 for Leukemia & Lymphoma Society’s Indiana Chapter and $5,000 for Opti-Park, which hosted the event for the past 19 years. This year’s beer fest took place at Military Park in downtown Indy, and though the weather was sweltering and a massive storm threatened the event the night before, plenty of shade and cool beverages kept us comfortable. 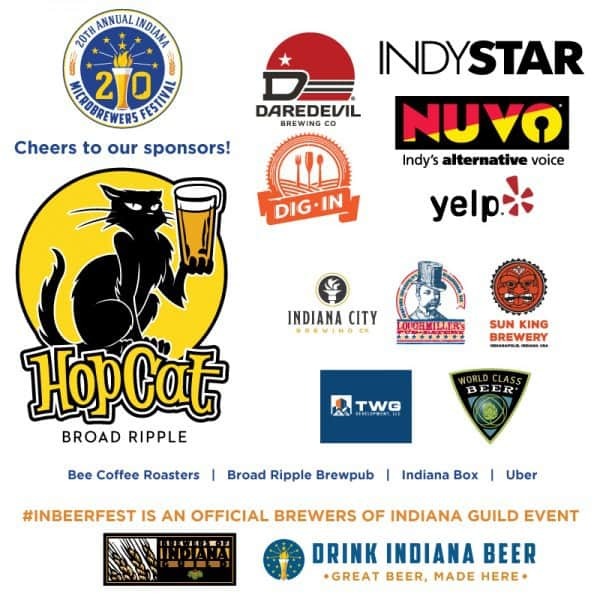 Every Brewers of Indiana Guild beer fest raises money not only for our efforts to support the Indiana brewing industry but also for local non-profit organizations. This year the 7th Annual Winterfest raised almost $19,000 for Joy’s House, and the 5th Annual Bloomington Craft Beer Festival benefited Lotus Education & Arts Foundation to the tune of $8,000. If you joined us at the summer festival, check out the video and photos below to relive the fun, and if you missed the souvenir tees and Drink Indiana Beer hats, get ’em online now. Missed the event? Join us at Winterfest on Saturday, January 30, 2016 at the Indiana State Fairgrounds for hundreds of beers from around 100 breweries. Subscribe to IN Brew News to be the first to find out when tickets are available. A huge thanks to our sponsors for making Indiana’s best summer beer fest possible! Indiana Microbrewers Festival photo album by Brewers of Indiana Guild.